4 personalized coasters that make for the perfect wedding gift! At 1/8 thick, and 4×4 in size – these coasters also come with anti-skid feet. 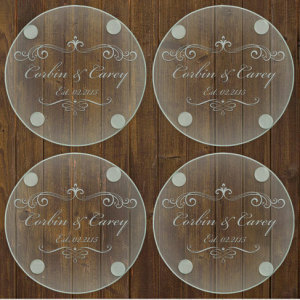 There are 4 coasters total in a package, and are perfect for wedding favors. Personalization is welcomed! Please email us at shop@bestbride.la with your preference of design, all of the designs can be found in the pictures above. Please also provide us with your name customization. Shipping costs $3.00, please allow a week for delivery.